It was time to start work on the torso. There are a couple of key elements to it and I wanted to use the time I had between my bigger projects to keep working on this guy. 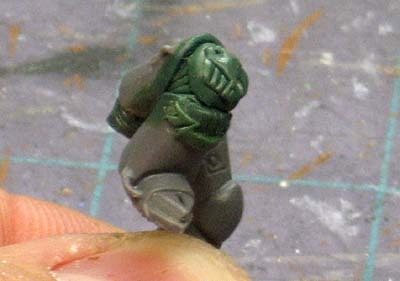 First up was the chapter icon on his breastplate. Instead of sculpting it in place, I decided to sculpt it on a piece of plastic and then go in and add it to the model. It's a flat icon so all I'll needed to do was fill in some gaps behind it once it was glued in place. I sculpted the brackets that held it in place and used those as a way to fill in the void space behind the icon. I deliberately made the icon slightly larger than the real one since this guy will be posed in such a way that you'll barely be able to see his chestplate. I wanted this to stand out a bit even though most of it will be hidden from sight. It will also balance the model visually by adding a little bit of weight to the front of the model since he's got that huge jump pack on his back and a new helmet with a longer nosepiece. 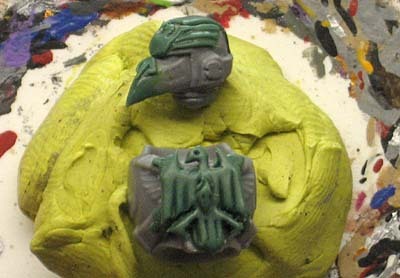 Then I sculpted the tiny raven skull in the center of the icon last. I added the helmet to this pic so you could see the shape of his new nosepiece since my last pic of it was no good at showing the new shape. 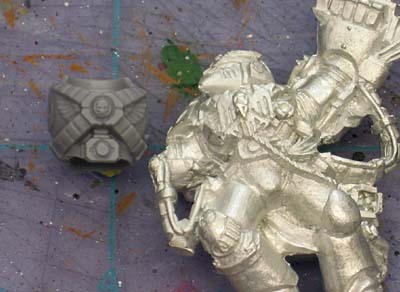 I sculpted a small piece of rope to add the Terminator Honors to that will hang from the icon. The purity seals, grenades and bolt pistol will all be added last. Another little detail was the scrollwork on his right greave. Sure, you won't really be able to see it, but I want this guy to be as close to the real one as possible without taking too many liberties. It looks like I'll be lucky with his left arm in that I only need to modify the shoulder joint and not the whole arm to get it in the correct position. The right arm is another story though. That's going to take some real surgery to get it in position. Really all that's left are his arms and shoulderpads. Of course, there's plenty to do with those. That's why I'm avoiding them. looking amazing, props on the GS Eagle. Gawd damn that helmet looks slick. Thanks guys, I just finished his arms and I'll be posting those pics later this week. Hotness, Ron. I'm really diggng the details into your thought process. Can't wait to see the arms. You're saving the best for last! Cawshis Clay: I saved the hardest part for last hoping it would magically solve itself. No, try a sonic scwerdriver. Magic wont work. Derina: I realized that after the second try at sculpting his elbow guard. Fortunately for me, I had some pixie dust lying around and I was able to get it right on the third attempt. I'm putting the post together now, I'll have it up later on this evening. Your timing with this is impeccable. I recently decided to go with a Raven Guard successor scheme. 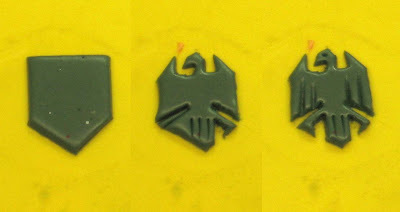 I was planning on using tyrannic war veterans with all the ultra marines stuff scraped off and was wondering how I was gonna make some raven logos to put in their place. Fair play Ron - this is top class stuff - can;t wait for the next stage! !